All custom winter frames are handcrafted from galvanized tubing using various gauges from 1″- to 1″ ¼ reinforced at all stress points and joined together with special solid cast aluminum connectors. 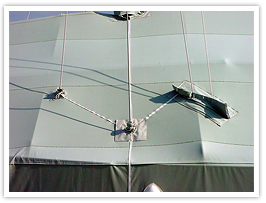 Each custom winter cover is made of marine grade Sunforger® material designed to repel the harsh winter elements. 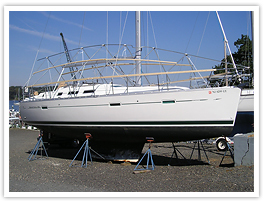 Sunforger® is 100% soft, breathable cotton that can be used on all types of delicate boat surfaces. An amazing marine canvas if we do say so ourselves. 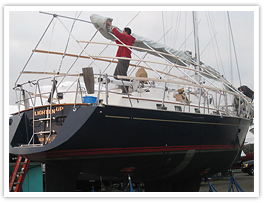 We use only the best quality marine canvas and custom winter frame materials like Sunforger® and Topnotch® which can be used on the most delicate boat hulls. Sunforger® is made from 100% cotton army duck canvas. It has a very high thread count (54 X 42, two by two). This means that in every square inch the weave has 54 passes in one direction and 42 in the other, with 2 threads joined in each pass. The custom winter cover is pre-treated in the mill with Sunforger® process, making it a marine canvas suitable for outdoor use on land or sea. The mineral dyes used are totally safe, and give it added water repellent and resistant to mold and mildew. The Sunforger® process pre-shrinks the fabric, and is superior to water-proofing, for it leaves the canvas able to breathe and therefore, not trap moisture. Remove snow loads, only takes about 15 minutes to get aboard and pat the underside of the boat cover to knock the snow off, if done shortly after the storm. Do not leave your boat cover on over the summer. 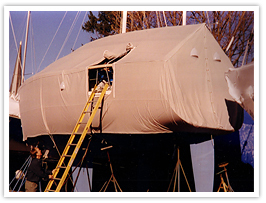 Remove cover, dry, and store your boat cover in a dry place. 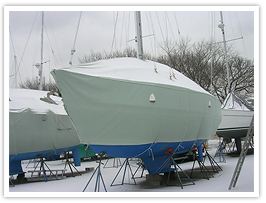 For a quick turn around on your Fairclough boat cover, please bring your custom winter cover in as soon as it’s removed from the boat. (April- July). Note: Repaired boat covers must be picked up, or arrangements made for shipping 30 days after billing to avoid $50.00 a month storage fees. All covers should be sewn between 10-12 years into its life. (look for double-digit on cover logo) Re-sews can happen earlier if left on year round. When receiving your new boat cover, you should save the box it was shipped in. Use this box to ship the cover back. 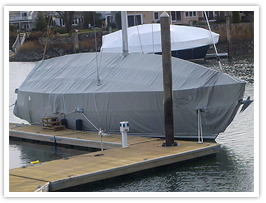 Use UPS shipping for the boat cover. Alterations of new marine covers should be discussed with a Fairclough Sailmakers representative. Note: During the busy season, we are not able to make scheduled appointments with customers on installed jobs.